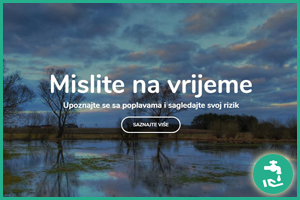 SOS121 is a flood protection system providing citizens with as much information as possible to be prepared in a crisis, after record floods in 2014 saw half of Bosnia and Herzegovina under water, many deaths and thousands of people without power. The project combines IoT devices placed on river banks, a centralized system that processes all data and delivers it to the mobile app and the SOS121 website. Other features include a very attractive and simplified dashboard, an option to see water levels from multiple telemetric units and for users to ask for help, a safety check option and a volunteer database that is managed via the web app by the responsible authority. Users can apply to become volunteers, can get important information at a glance, including manuals and instructions, and can interact with authorities. Volunteers are filtered by expertise, skills and equipment, ready to be called up for deployment by a central notification system. Targeted communication in real time helps authorities and citizens to prepare for emergencies, avoiding panic, casualties and damage. “This project has been picked by the jury because of its interesting open data approach to disaster prevention. Making a network of volunteers a vital part of an ongoing information network not only makes for great redundancy, but also helps to democratize data.